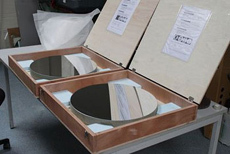 Huygens Optics was started in 2010 as an activity of Jeroen Vleggaar to produce high-quality telescope mirrors for the serious amateur astronomer. A workshop for this activity was found in the Huygens street in Hilversum. Because Christiaan Huygens (1629-1695) is undoubtedly one of the most famous Dutch astronomers of all times, the activity was fittingly named after him. Since 2015, Huygens Optics is working in a more general sense on the offering services in the area of glass and ceramics machining. The production of larger telescope optics has mainly been abandoned. The workshop has also moved from the Huygensstraat to a location in Hilversum Kerkelanden. Our technical knowledge is also available as technical consultancy. We can support you in various areas of expertise with your innovation processes. The support is available both on "ad hoc" basis, as well as long-term technical support. Due to a broad knowledge of materials, optics, thin-film technology, mechanical design and software, Huygens Optics can be both a sparring partner and an information source. The availability of a indepentent workshop for glass and ceramics allows that the consultancy is supplemented with the production of prototypes in these materials. For more information on the different options, please contact me. View Terms and Conditions of Huygens Optics (in Dutch, opens new window).